Did anyone see this in yesterday’s Observer. Ed Vulliamy offered his 10 ‘best revolutionaries’. Any additional names that should be in the mix? “It’s 1994 since the first ceasefire, we’ve been through the whole issue of decommissioning and the weapons being put beyond use, the final statement of a ceasing of operations,” she said. There may well be an element of making a virtue of necessity. On current polling data such an outcome seems remote. But there’s also the point that such statements from her and others in SF does tend to lock them further into a context of not being able to enter any such centre right coalition without clearly contradicting those self-same statements. One has to presume that she and others in SF are entirely aware of that. And indeed of what has happened to parties that have been perceived to have broken pre-election promises, even those hedged with caveats. We’re looking for short films about working people. The third London Labour Film Festival will screen a selection of labour-related shorts throughout the film festival which takes place next month. These short films will be screened between the feature length films. We would like to invite you to be part of this. We are asking people to submit short films to the festival. The films and videos submitted can be made in the UK or anywhere in the world. The films will be labour-related, they can be about any and every aspect of work, as well as those issues affecting unionised workers and those not represented by unions. The selected (winners) will be chosen by a global panel of judges and shown as part of the festival. The shorts selection competition is open to anybody. The purpose of the contest is to discover the hard work of filmmakers whose voices have yet to be heard. The winners selected to be screened will be determined by a global panel of judges. Thanks — and please spread the word! Posted by WorldbyStorm in Irish Left Online Document Archive, Northern Ireland Report. 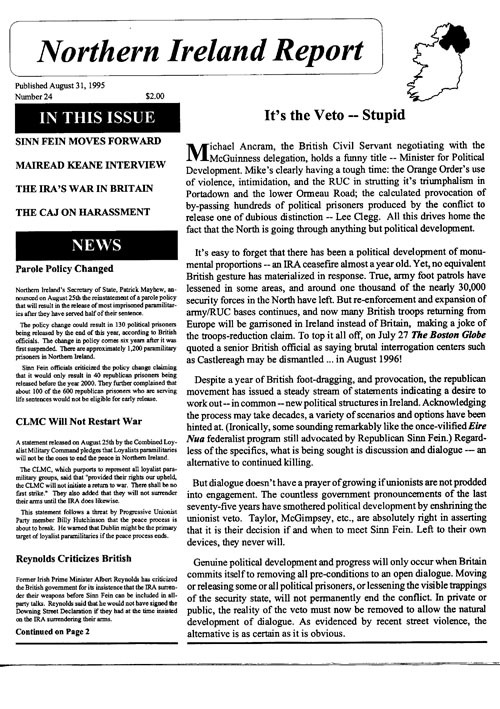 This document adds to our collection of Northern Ireland Report, a US based publication from the 1990s which sought to position itself as a left critique of Sinn Féin. The edition we first posted up some time back was Number 2 from 1992. This, Number 24, from 1995 is obviously positioned at a different time in the progress of the peace process. In that respect the leading article is ‘It’s the Veto—Stupid’. Other pieces deal with the Combined Loyalist Military Command’s statement that it will not ‘restart war’, another notes the IRSP argues the IRA should reconsider its ceasefire. Another has former Taoiseach Albert Reynolds criticising the British. Sinn Féin has won the first stage of the peace – hands down. Since the mid-1970’s, the vast majority of the general public has equated the IRA and SF with crisis (e.g. the Hunger Strikes, Gibraltar and its bloody aftermath, Warrington, etc.). Today the republican movement has transformed its public image, conveying an image of flexibility via a leadership quickly learning the ropes of international statecraft. And while no delusions should be harboured regarding rewards to date – there have been no tangible rewards – republican flexibility signals a maturing and growth of the movement which will serve them well in the days ahead. There’s an interview with Sinn Féin’s Mairead Keane, who at that point headed up SF’s Washington D.C. office. There’s a fairly critical analysis of Martin Dillon and his works on the conflict in Northern Ireland. NIR is an independent publication and is not affiliated with any political party, group or organisation in Northern Ireland or the United States. I very much liked this piece by Perry Anderson which was linked to during the week (and many thanks to the person who did so). A lot to reflect on – not least his views on the Ukraine conflict and perceptions of same more broadly. But culturally and politically, what of this? The better younger directors are less given to this kind of accommodation to power. But even an auteur of such independence as Andrei Zvyagintsev, no friend of the regime, has felt it necessary to avow the Christian faith behind his breakthrough, The Return, and garb his recent attack on official corruption of church and state alike, Leviathan, from a biblical wardrobe as a modern tale of Job. Lower down, there are few depths contemporary Russian cinema has not plumbed. Leading hits include The Island—tale of a repentant monk, who after committing lethal treason at German order during the war, has become so holy that nature itself departs from its laws in his presence; The Admiral, depicting the White supremo Kolchak in a ne plus ultra of schmaltz as a tender lover executed by the Bolsheviks, his corpse sinking cruciform into the Siberian ice; and The Miracle, scripted by Sokurov’s screen-writer Yuri Arabov, the ‘true story’ of a young girl who casts away her mother’s icons except for Saint Nicholas, whom she takes to a louche party—and there, as she dances clutching it, is frozen motionless for her impiety, until months later Khrushchev arrives and gives the grudging go-ahead for an exorcism to liberate her, murmuring as he flies back to Moscow, ‘A miracle—such beauty: as if an angel has flown’. The cultural sump of this sort of Russian cinema makes even the worst films of the Soviet era look presentable. I’m not well up on how the White’s are regarded in Russia since the fall of the Soviets, but to judge from this there’s a sort of wholesale reevaluation of them, even if only in what appears to be a nostalgic/emotional way. Most of us here of whatever persuasion on the left (and personally in that conflict I still have a sneaking regard for Makhno, for all his faults) would tend to view the White’s as reactionary, at best. Has anyone any knowledge of this trend in Russian culture? Speaking of bizarre, here’s an odd piece by Nick Cohen in regard to the British Labour Party contest. I’ve always thought, and I know I’m not alone on the site in this respect, that in relation to a range of matters Cohen, whatever his approach in regard to Iraq etc in the 2000s, was fairly on the nose. Perhaps less so in recent times. But maybe there are good as well as shabby reasons why Corbyn’s past has failed to detach supporters from his cause. Until now the hypocritical, and in my view despicable, strain of thought that Corbyn represents has been dominant in the universities, the arts, political comedy and much, but not all, of the left-wing media. In what passes for liberal culture it is commonplace to condemn Western crimes while ignoring or excusing the crimes of anti-Western regimes and movements. But, politically, what artists and academics think has had little effect. The attitude of a British government that puts arms contracts before human rights in its dealings with, say, Saudi Arabia mattered far more for the glaringly obvious reason that it was in power and the Left was not. Not just Corbyn and his supporters but much of the liberal Left announce their political correctness and seize on the smallest sexist or racist “gaffe” of their opponents. Without pausing for breath, they move on to defend radical Islamist movements which believe in the subjugation of women and the murder of homosexuals. They will denounce the anti-Semitism of white neo-Nazis, but justify Islamist anti-Semites who actually murder Jews in Copenhagen and Paris. In a telling vignette, Corbyn himself defended a vicar from the supposedly liberal and tolerant Church of England who had promoted the conspiracy theory that Jews were responsible for the 9/11 attacks. When the far Left shades into the far Right, I am tempted to hug the centre and treat it as our best protection against the poisonous and the deranged. Respectable commentators have urged Labour members to do the same. They failed to understand that in Labour’s case the centre ground is as polluted as any derelict site. A former senior garda, involved almost all his life in fighting the IRA, outlined a few years ago what he thought the Provisionals’ plans for assuming absolute power in Ireland would entail. He pointed to IRA documents that had become public over a decade ago referring to what it termed “TUAS” – “tactical use of unarmed strategy”. This, he believed, was what would be the “likely” way forward. They (the IRA), he said, will bring down the power-sharing government in the North, precipitating a crisis and, in parallel, undermining and replacing the existing party political structure in the ’26 Counties’. With power in the South and a crisis on its doorstep, this garda – who was held in very high esteem by colleagues – thought the Provos would then institute some form of ’emergency’ government in the Republic, doing away with the need for elections and democracy and the establishment of a single-party state. Just like that – eh? Apparently so. And the contemporary relevance? 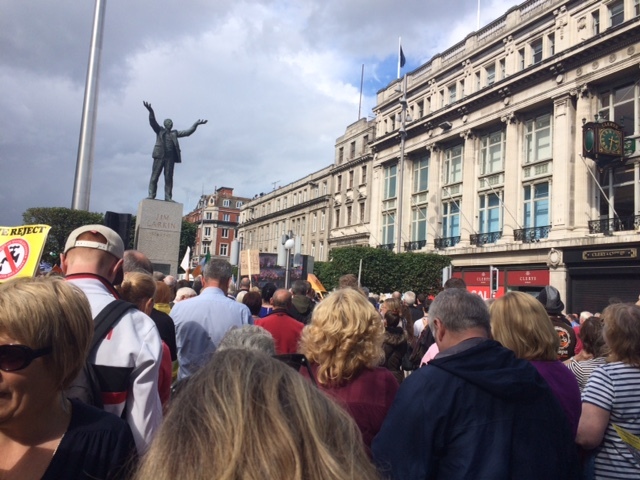 Up until last week, this view of the Provos’ seditious plot to overthrow the legitimate government of the Republic would have been firmly placed by a large constituency of politicians, senior civil servants and media people as the fantasy of some kind of old-fashioned loony. Only up until last week? 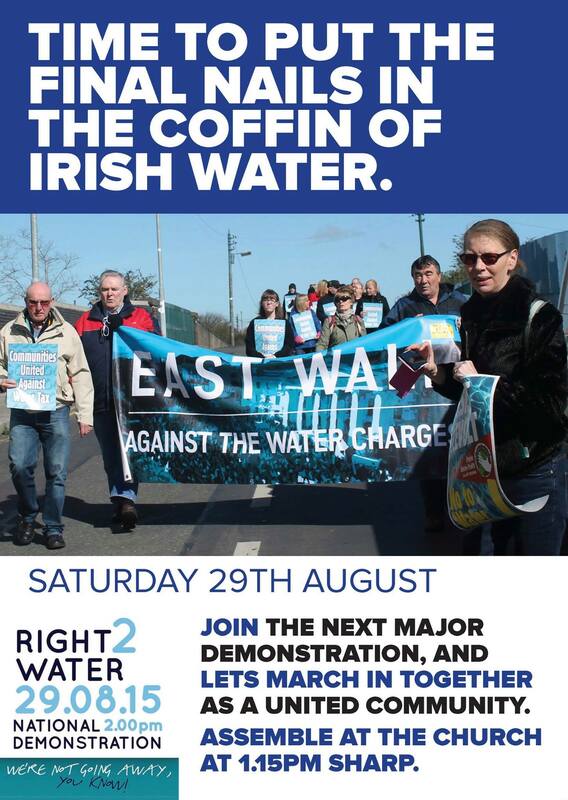 This will not be good news to the government that… and granted at this point figures seem a bit in short supply, there was a remarkably good turnout today on the water protest. Whether anger or hostility it seems to be unabated. Any thoughts on implications in terms of policy, and/or the timing of the election? And what about potential political progress for those involved in the protests? Interview with Paul Saba about the New Communist Movement in the US and other areas of The Left in the US.